How do microchannels improve heat transfer? Why are COMHEX© microchannel heat exchangers innovative? What is the difference between the ultra compact heat exchanger Comhex© and a PFHE? A compact heat exchanger is a heat exchanger with a high area density compared to traditional heat exchangers (such as the S&T heat exchangers). The area density is the ratio of heat surface transfer to heat exchanger volume. The higher it is, the more compact the heat exchanger is: for a given power, it will be smaller, lighter, and with a much lower fluid charge. According to the Shah’s definition, for a heat exchanger to be considered compact, its area density must be greater than if at least one fluid is a gas, or in the case of a liquid/liquid exchanger. The compactness of an exchanger can also be defined by its hydraulic diameter, which must be less than 6 mm. With an area density of up to and a hydraulic diameter of , Comhex© heat exchangers fit largely this definition. They can even be described as ultra-compact, surpassing by its area density most of the compact heat exchangers found on the market, as shown below. These last decades, microchannels are attracting more and more the researchers attention. Higher efficiency, lower refrigerant charge, space-saving, lighter devices are some advantages inherent to their nature of high compactness. The smaller the size of the channels is, the higher the area density is. is the hot fluid temperature and is the cold fluid temperature. The overall heat transfer coefficient depends on the thermal transfer mechanisms and can be enhanced by the presence of corrugations. The last but not the least, the surface is determined by the geometry and the dimensioning of the heat exchanger. The greater the exchange surface is, the more powerful the device is. 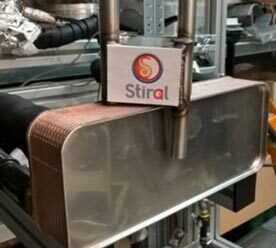 The increasing of the heat transfer surface of a device seems to be an easy way to improve its thermal performance, but has a serious drawback: it increases the volume of the heat exchanger as well. It means a bigger, heavier heat exchanger using more fluids. And this a reason why compact heat exchangers are so interesting: they allow a minimal volume increase for a maximal surface increase. The area density is a key-point to have a larger heat transfer surface with the smallest volume. As a rough approximation, area density can be considered as more or less proportional to the inverse of a rectangular channel width. Thus, the reducing of the width leads to a strong increasing of the area density. For equivalent volume and weight, a microchannel heat exchanger will have a much larger heat transfer rate. Thanks to its ultra-compactness due to micro-scale channels, Comhex© offers a powerful heat exchanger that concentrates all the advantages of compact heat exchanger in a very small space . One can find microchannel exchangers under the abbreviation of MCHE (MicroChannel Heat Exchanger). However, these heat exchangers actually have microchannels for one single fluid, the other fluid (generally air) passes through fins. More precisely, the conventional MCHE consist of tubes of mini or micro-channels, most often made of profiled aluminium. Fins are brazed on these tubes. Thus, the fluid arrives from the circuit via the header, rushes into the tubes, transfers its heat to the metal structure and evacuates it through the fins. Although this technology offers many advantages (heat transfer enhanced, compact design, light weight, lower refrigerant charge, lower pressure drop per unit heat transfer), it contains a significant limitation. As said above, the atmospheric air runs through traditionnal fins. Our Comhex© exchangers overcome this limitation thanks to their innovative design. A unique combination of technologies now makes possible the two fluids to circulate in micro-channels, improving both thermal performance and versatility. With the use of stainless steel 316L, it offers a wide possibility of choices for the both fluids, whether they are liquids, gas, or liquid/gas. Thanks to Comhex©, it is also possible to overcome another problem inherent to conventional MCHE. Indeed, it can happen that a condensate is formed on the fins, or in some cases, frost. These phenomena are detrimental to the performance of MCHE and require the implementation of a condensate drainage strategy. Nevertheless, this does not happen with the microchannel heat exchanger Comhex©. What is the difference between the ultra compact heat exchanger Comhex© and PFHE ? 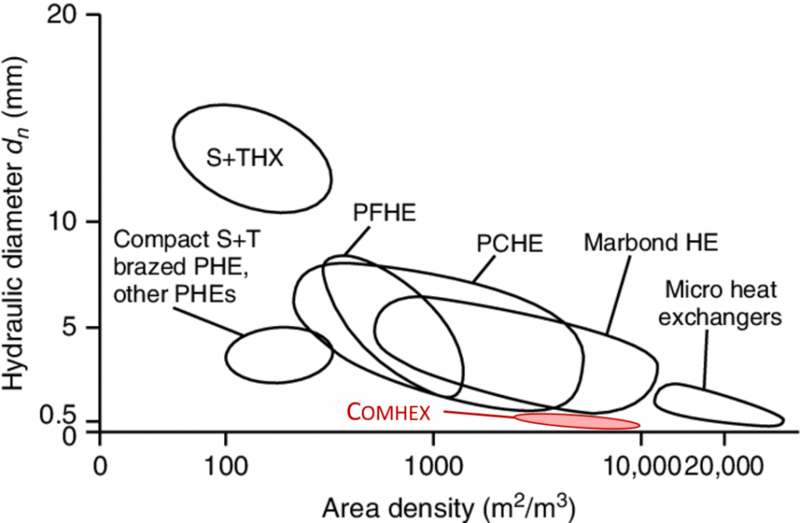 One can notice a similarity between Comhex© and Plate Fin Heat exchangers (PFHE) appearances. It is true that both are made of blocks corrugated sheets interposed between flat plates, all assembled by brazing. However, if a likeness does exist, the operating principles are clearly different. In the PFHE case, this aims at creating a series of finned chambers. One single fluid circulates by one finned chamber. Heat is transferred through the fins and plate interface from one fluid (i.e. one finned chamber) to the other. In the Comhex© case, flat plates serve as feeders. As it is shown on the figure above, each side of a corrugated sheet is fed by one flat plate (feeders). So, each side of the corrugated sheet is fed with a different fluid. As a result, hot and cold fluids circulate in rectangular microchannels in very close contact, only separated by a thin sheet of stainless steel. In other words, Comhex© provides a much more intense heat transfer than PFHEs do. Comhex© is an ultra-compact eco-friendly heat exchanger using an innovative technology called full-microchannels. Thanks to its unique design, it is possible to reach an unprecedented level of performance. 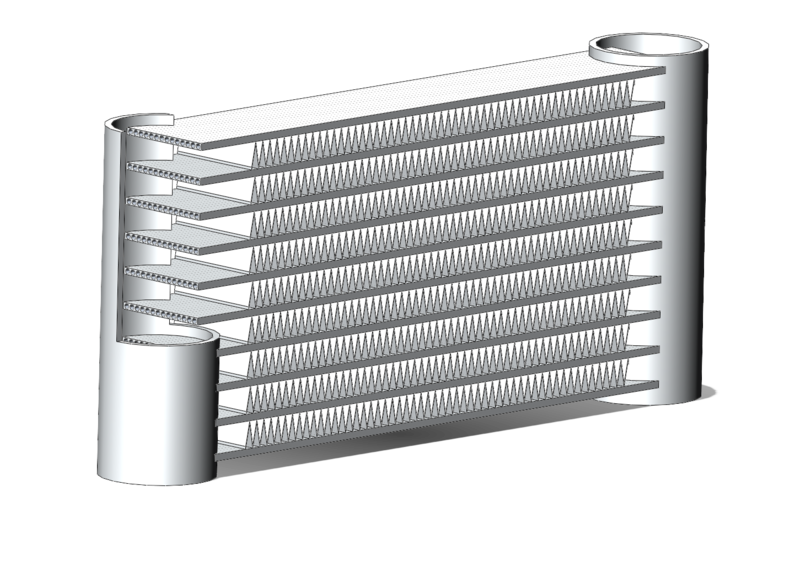 A heat exchanger is considered as compact if it has an area density above if both fluids are liquids or otherwise. 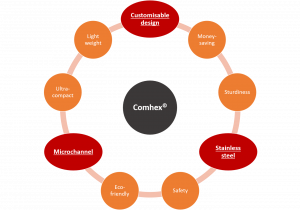 With an area density from to , Comhex© provides a very high level of compactness, which leads to the many advantages. By choosing Comhex©, you get a highly efficient heat exchanger. As the primary consequence of its high level of compactness, Comhex© is significantly smaller at equivalent thermal performance. It means space-saving and lighter devices. These are key-advantages for embedded applications, where dimensions and weight can be highly restrictive (fuel economy, limited space, weight constraints, etc.). By choosing Comhex©, you get a successful heat exchanger for a minimal footprint. By definition, the more compact a heat exchanger is, the less refrigerant you charge. For environmental and safety reasons, regulations are becoming stricter and stricter. By choosing Comhex©, you get a safe eco-friendly heat exchanger which gives you a major asset for a better attractiveness. Another consequence of the high compactness of Comhex© leads to substantial economy. As the heat exchangers are smaller, they need less raw material. It reduces raw material costs and dependence to the metal price fluctuations. Comhex© is also easier – and so cheaper – to store and to transport. By choosing Comhex©, you get a small but smart heat exchanger which saves money on raw material, transport and storage. With no mobile piece nor obstructed flow, Comhex© reduces noise – a main advantage in an AC use, where louder devices could disturb clients and residents. By choosing Comhex©, you get the quietness of an efficient heat exchanger. Comhex© is made of stainless steel 316L and nickel, which are highly compatible materials in order to prevent the galvanic corrosion. This kind of corrosion occurs when two metals of different electronegativities are in contact, such as aluminium and copper in F&T traditional coils. Moreover, stainless steel 316L has good mechanical properties, can support a wide range of temperatures, and resists to many aggressive fluids. By choosing Comhex©, you get a robust heat exchanger, that fits for many applications. As a consequence of the lower fluids charge and the stainless-steel sturdiness, Comhex© is a safer heat exchanger for your sensitive installations. The smaller the refrigerant charge is, the smaller are the consequences in case of incident (such a cars collision). By choosing Comhex©, you get a safer heat exchanger for goods and people. Enhanced heat transfer and low-pressure drop are antagonist requirements. Nevertheless, thanks to a flexible design, it is possible to reach the best compromise. Lighter weight, smaller size, lower hold-up volume, lower pressure drop, etc. Whatever requirements you have in mind, we put our knowledge at your service to find the most suitable design. By choosing Comhex©, you get a customized heat exchanger that will reach your goals. Modern environmental and safety regulations are becoming every day tougher for more efficient systems. This is not only a matter of saving money, but also of preserving our world for the future generations. Fully aware of the challenge, we endeavour to conceive and produce a greener heat exchanger on the cutting edge of technology. Constant innovation is our motto. By choosing Comhex©, you contribute to a better world for the children of tomorrow.